 Ultrasonic, Ionic and Yellow Light Phototherapy for a brighter skin tone, fading of dark spots while rejuvenating the complexion and enhancing the results of your skincare products. Only logged in users may leave a review. Destroy Acne by Killing Bacteria at the Source using our Cutting Edge Ionic, Photonic, and Sonic Technologies delivered by our IPS Acne Defeating Complex. Red photonic LED: Wave length 622±5nm, stimulates the generation of collagen and cell vitality for firmer skin. Its mild wave length can also be applied on sensitive areas such as skin around the eyes and T Zone. ION CONDUCTING Ion conducting offers micro galvanic stimulation to skin which activates cells. 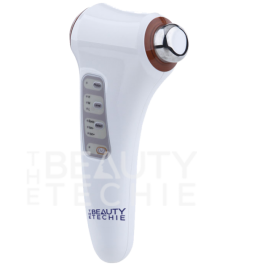 This revolutionary mini beauty device delivers Red Light LED Phototherapy and 1Mhz of radiofrequency energy with the temperature adjusting from 41°C to 45°C. Regular use results in increased collagen production, lifting of sagging skin, reduction of hyperpigmentation as well as the increased effectiveness of your skin care products. Bipolar Radio Frequency: High-Frequency Wavespenetrate the dermis transforming electrical energy into heat energy to promote the growth and repair of skin tissue. The skin is heated to a surface temperature of around 42°C which is the optimal temperature for collagen production. The collagen in dermis will immediately shrink and generate new collagen continuously when Radiofrequency warms the skin. The surface layer of skin will be lifted and firmed significantly. 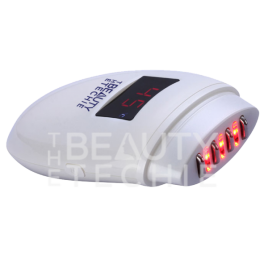 Red Photonic LED: Wavelength 620nm-630nm, promotes collagen formation and increases skin elasticity. With regular use, damaged skin cells regenerate and new collagen is produced at a higher speed, which results in collagen synthesis and tissue growth at an increasing rate. Technology • Red photonic LED: Wave length 622±5nm, stimulates the generation of collagen, allowing skin to regain its youthful vitality and elasticity. Its mild wave length can also be applied on sensitive areas around eyes and forehead • Blue photonic LED: Wave length 467 ±5nm, prevents pimples by killing acne causing bacteria and balancing sebum production. • Yellow photonic LED: Wavelength 580 ± 3nm, is mild and well suited for sensitive skin. It can gently stimulate lymph system, increase skin immunity and reduce skin sensitivity. Consistent use can improve dull skin tone and fade dark spots for skin brightening effects.